For centuries, the American dream has attracted people from all over the world, lured by the promise of a better way of life. As a population, Americans are unique in having such a thing as a collective dream. However, as history has progressed, faith in the American dream has diminished, tainted by the scepticism and doubt of modern society. The American dream is rooted in the USA’s Declaration of Independence. It proclaims that "all men are created equal" with the right to "life, liberty and the pursuit of happiness.” Popular culture later transformed its true meaning, particularly during the sustained economic boom of the roaring twenties. In these times, the dream became synonymous with prosperity, democracy and liberal freedom. "The American dream is that dream of a land in which life should be better and richer and fuller for everyone, with opportunity for each according to ability or achievement." Many artists have been inspired by the American dream. Some interpret optimism, hope and patriotism in their work, while others portray the dream as an unattainable illusion. Pop artist Robert Indiana famously created an American dream series of paintings that explored American identity through vernacular signage, logos and vocabulary. On the surface his dazzling compositions reflect quintessential American style, but beneath the many layers of visuals is an intricate darkness that draws upon American society. In contrast, Jasper Johns took a different approach to interpreting the American dream, creating highly patriotic encaustic paintings of the American flag. The technologies and multiculturalism of the 21st century has transformed America beyond recognition, but still the American dream remains and artists continue to be inspired by this. Peter Rocklin, for example, creates beautifully atmospheric and evocative paintings of American urban landscapes that are incredibly escapist representations of reality. 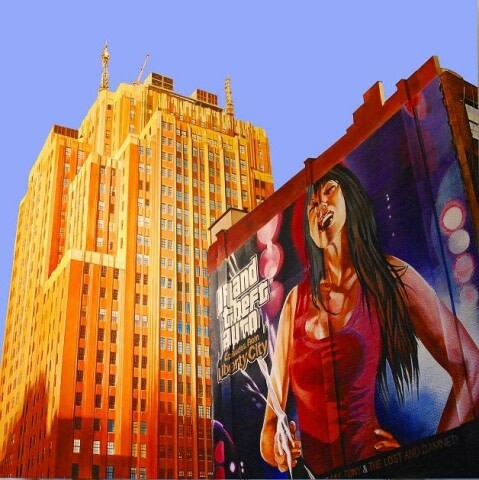 In Liberty City - NYC Mural, Rocklin bathes a New York skyscraper in almost-ethereal light. In one sense, the illuminated skyscraper emerging from the shadows beneath represents the hope that is central to the American dream. 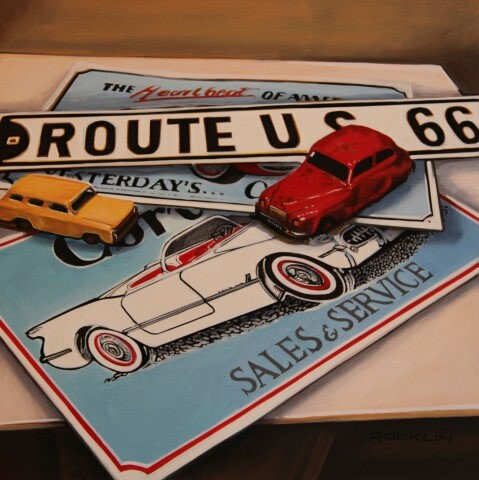 Rocklin is also known for his paintings of everyday paraphernalia, such as the Route 66 memorabilia featured in An American Dream. Ever since Henry Ford began mass-producing his revolutionary Model T more than 100 years ago, Americans have been engaged in a love affair with the limitless opportunities and enduring myth of the open road. Route 66, single most famous road in America, became iconic of this ideology. Ralph Goings, one of the original members of the Photorealist group of the 1960s, has also explored the concept of the open road. He conveys the American dream in a way that suggests if you don't like the place you are in, there's always an escape to somewhere better. In this sense, Goings captures the balance between American optimism and melancholy. A native Californian, Goings analyses aspects of the American lifestyle that are so often ignored. 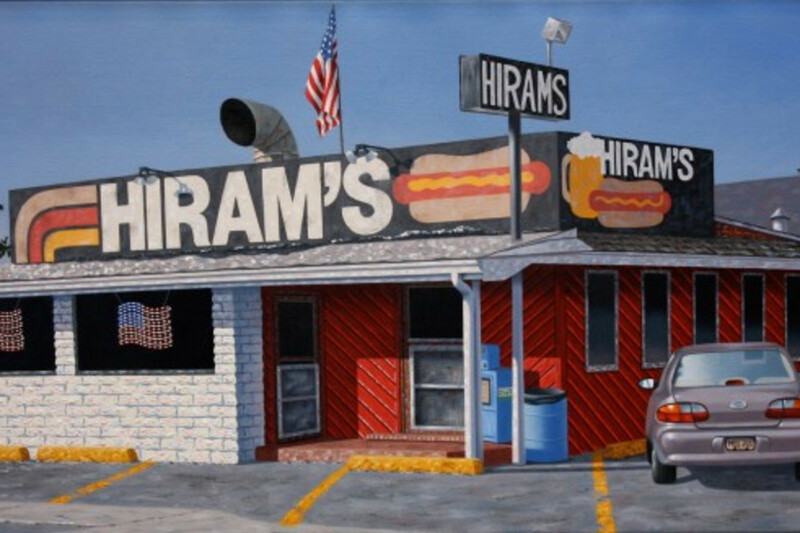 From watercolour snapshots of parked trucks in Californian suburbs to ketchup bottles and salt shakers in traditional American diners, he draws our attention to the everyday experience of American life. Mike Briscoe’s paintings also include themes relating to the open road. 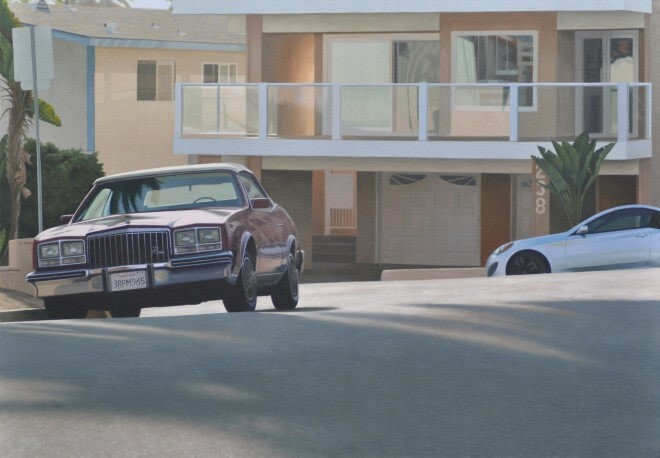 His oil on linen paintings are usually absent of human presence, instead concentrating on inanimate objects such as buildings and automobiles. Despite the lack of human activity, Briscoe creates the feeling that something is about to happen. In California Suburb Late Afternoon, two cars are pictured on an otherwise empty Californian street. The building pictured in the background is perhaps representative of the modern American dream – a strong and safe foundation undoubtedly worth a lot of money, while the tropical plants outside the building give the building a strange sense of exoticism. However, the two cars parked outside are a constant reminder that the owner could, at any given moment, decide to pack up and leave it all behind for something even better. Not all hyperrealists paint the same optimistic picture of American society. 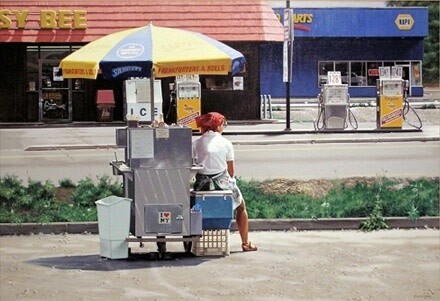 Mark Oberndorf is best known for his paintings of run down drive-thru’s and American diner signage. 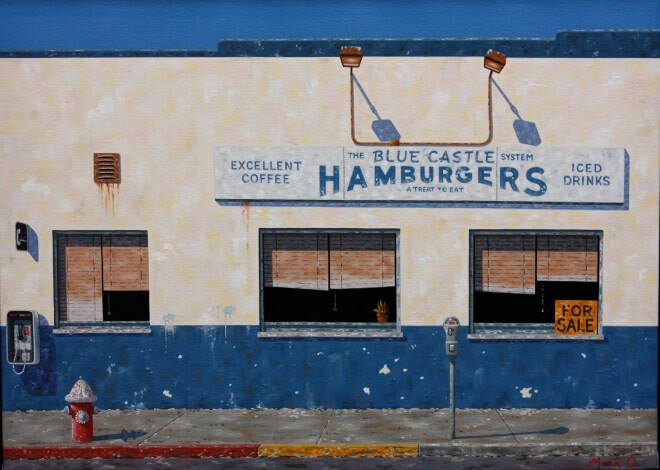 In Blue Castle, a dilapidated and seemingly abandoned hamburger joint is pictured in a state of disrepair. Paintwork is chipped, blinds are uneven and a sale sign in the window confirms the building’s neglect. Once upon a time, this burger joint would have been a lively hub of people striving for the American dream. Now it sits empty, perhaps a commentary on the state of the so-called dream in 21st century society. In this sense, Oberndorf suggests American citizens have become disillusioned with reality and have abandoned the American dream. However, for many the dream still represents a lingering hope. Many artists choose to embrace the unique sense of possibility that this country gives its citizens.